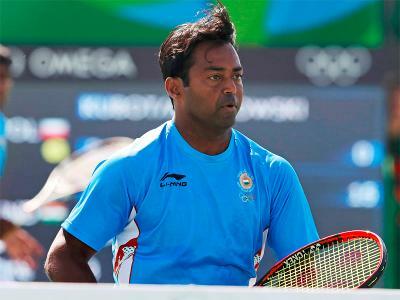 New Delhi, Sep 18 (PTI) Indian ace Leander Paes is one of the biggest stars in doubles and one of the best players in the history of tennis, said fourteen-time Grand Slam winner Rafael Nadal, who led Spain to the Davis Cup World Group by winning the doubles match here. "He (Leander) played a great match. It was so amazing tonight, it is a pleasure to play him here in his country. He is one of the biggest stars of doubles and one of the best player in the history of the sport," said Nadal after he, along with Marc Lopez, led Spain back into Davis Cup World Group by beating Leander Paes and Saketh Myneni 4-6, 7-6 (2), 6-4, 6-4 in the doubles match last night. "So, it was great to compete against him (Leander), it was a tough match. They played well but we are happy to have the victory and come back to the world group, that's where we think we have to be with so many of our players being in the top 100. That's what was our goal and we did it. For us it was a very important confrontation after two years being away from the World Group." The Spanish pair, the Olympic champions, were a set and 5-4 down in the second set when they staged a fightback to eventually give Spain an unassailable 3-0 lead in the play-off. Nadal clarified that it was indeed a stomach bug that forced him to skip the opening singles match against Ramkumar Ramanathan on Friday. "It was not the wrist. Everybody knows my situation I have always been honest about it. My wrist is improving but it still bothers me a little bit. But I am happy with the progress. There is a lot of humidity here and after practice, I had lunch at hotel and I felt I was not feeling perfect to go on court. Feli (Feliciano Lopez) was in perfect condition to go to court so he played," said Nadal. Asked if they were confident of bouncing back after losing the first set in the doubles match, Nadal said: "We played point by point, that's all. When you lost a set at 5-3 that means you are in trouble. But at the same time the match is still long, we fought a lot and put a lot of balls in and we knew if we could increase the level we can win." "We were communicating all the time but the ball was not going to the right place all the time. In Davis Cup doubles there is always a lot of ups and downs and it was a typical doubles match. It was a great victory. It was important for us to win doubles because in the history of Spanish team it has been difficult to win doubles.